Customer relationship management (CRM) software provides an excellent customer information and activity record for users. All of the basic information needed to index customers and prospects by vertical industry, revenue, physical locations, contact files and even interactions with your sales force or online assets are available. Pairing CPQ with CRM delivers a whole new level of intelligence, utility and automation to your marketing and selling processes. CRM provides a place to go for demographic views of your customer base, and CPQ provides intelligence on product and environment within your install base. It’s nice to know that you can pull up a list of customers that run your product. Wouldn’t it be nice to know which customers are running your product by environment? Or perhaps those that are running your product with a specific option? CPQ provides a much deeper level of product information than might be found within a sales record that is likely driven by SKU number or product codes. With CPQ, you will get a complete picture of what each customer has installed. Environment, add-on options, location of multiple unit installations and specific product iteration information are all available via CPQ. This facilitates isolating sales candidates for upselling and cross-selling opportunities. Sales campaigns will deal with fewer qualified targets, but the targets will be more fully qualified than before. CRM can tell you that this or that customer is running an Oracle database for financials and administrative information or that the customer has MS Dynamics AX for ERP. It can provide information about onsite conditions such as extreme temperature, humidity or other physical conditions present onsite. This information is helpful in terms of pairing your solution with a compatible environment. CPQ fills in the blanks in this picture by providing information on how these conditions may have impacted previous product selections. CPQ presents options and choices to the buyer based on inputs received during an interactive interview process between the buyer and seller. If specific environmental conditions affected previous transactions, CPQ can provide knowledge about how the installation may have been modified to accommodate the product or how the product was modified to become compatible with the installation environment. This information may be reflected in specific options that were selected during the purchase phase or anecdotally within the interview responses or proposal documents. Future sales transaction will have access to this information and be prepared in advance to address these issues. CRM can access sales records and provide useful information to sales reps about previous product and sales cycles for specific customers. Who has what product and how long have they had it is the basic information required to drive many selling campaigns. Wouldn’t it be better if you could add some intelligence to this raw data? 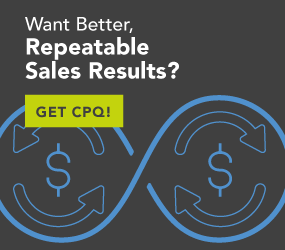 CPQ not only has the date of sale, it also can tell you how long the selling cycle lasted. It can provide information on what competitors were involved in the previous sale and provide insights as to which contacts were friendly to your solution and which ones were not. Within the proposal content, a full profile of the previous sale is available. What features were important, what shortcomings were of concern? And, what issues were not addressed that might be critical to getting the sale this time around. The other critical factor that CPQ addresses are those past transactions when the customer went with another product. CRM will likely not have easy-to-access, detailed information about losses. CPQ, on the other hand, will have all of that same information, plus the what, when, who and why of the lost sale. Going into the next sales cycle with this customer, you will have advance notice and time to prepare a response to those special issues from the past. When you have the transaction history from CPQ, you have a full picture of what happened, who was involved and why decisions were made—that is quite a leg up for future business. CRM can tell you what a customer paid for a product and if the customer qualifies for GSA or national account discounts. CPQ brings that to the table along with many other pricing and discounting functions. Special promotions are great opportunities to push new products, blow out inventories at year’s end or push weak sellers out the door by bundling them with strong sellers. CPQ is your go-to campaign enabler in terms of pricing and discounting these types of campaigns. CPQ knows who is and who is not qualified. It will also prevent Sales from offering discounts to non-qualified customers and automatically invoke the special pricing for those who are qualified. Additionally, in the future when people are scratching their heads wondering why this customer got such a great deal on a specific product sale, CPQ will be able to show what pricing was in force at that time. The discount will be explained, and the decision to carry that discount forward can be made based on current business practices by management. CRM is great at pulling up hard data about products, contacts and companies. But, what about anecdotal information associated with specific contacts, company locations or issues present during a previous transaction or proposal? CPQ augments the CRM view of the customer by providing a full record of each sales transaction and proposal presented. When Sales deals with existing customers, there can be a tendency to assume that they are already sold on your solution. But, that’s not always the case. Sometimes, the previous transaction was a great compromise, and the perception was your product was picked because it wasn’t as “ineffective” as the other guy’s product. CPQ provides extensive information on the nature of the sale and the perceptions at work during that sale. If your solution barely came in first during that previous sale, your team will want to know and understand why that was the case. Issues of importance then may still be important today. Product deficits then may now be product strengths. The proposal and interview notes associated with that transaction offer a much higher level of knowledge about the customer than CRM can offer by itself. CRM is a wonderful tool, and most selling organizations embrace CRM functionality as critical to their success. Adding CPQ to your stack will boost CRM functionality by several orders of magnitude. CPQ with CRM is like hot-rodding the CRM app. CPQ will give your sales reps a winning edge.